Have you seen all of the things you can makes with old sweaters? I've hesitated to try my hand at any of them because I wasn't sure about sewing something bulky on my sewing machine. Well, today I tried, and I'm super happy with the results. and when I put it on, I noticed there was a gaping hole right under the turtleneck. I don't know how it got there and I hope it wasn't there the last time I wore it. Anyways, now I had the perfect opportunity to do something creative with it. So......I decided to make mittens. about a 1/2 inch larger than my hand, to use as a template. I turned the sweater inside out and pinned the template to it. I tried to line it up so that the main pattern on the sweater ran down the middle of the mitten and the bottom finished edge of the sweater would be the top edge of the mitten. Using my sewing machine, I sewed right around the edge of the template. Then I cut around the stitching leaving about 1/4 inch of "fabric/yarn". Lastly, I turned the mitten right side out and then repeated the same process. Only this time, I turned the template over so that the thumb pointed the opposite direction. This created a right hand and left hand mitten. I didn't have a clear vision for this project when I started, so I was winging it at this point. 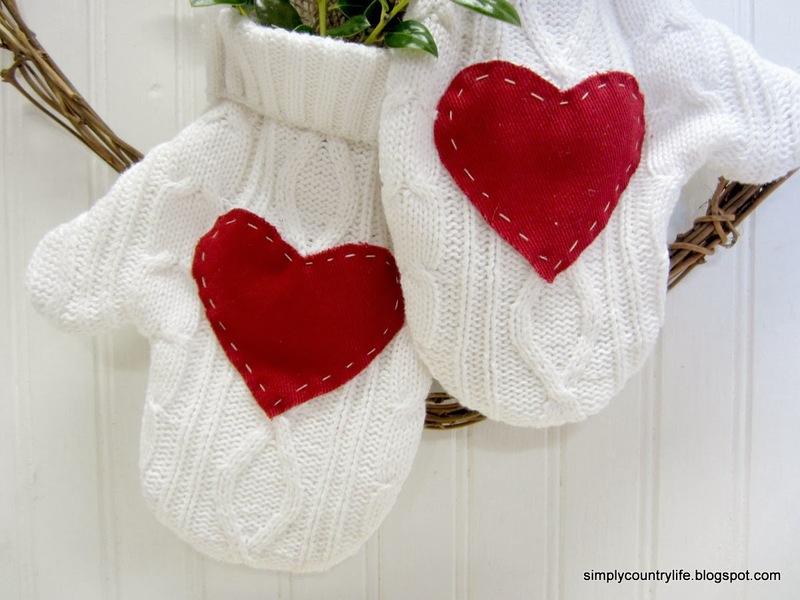 I cut hearts from red corduroy fabric and hand stitched them onto each mitten. 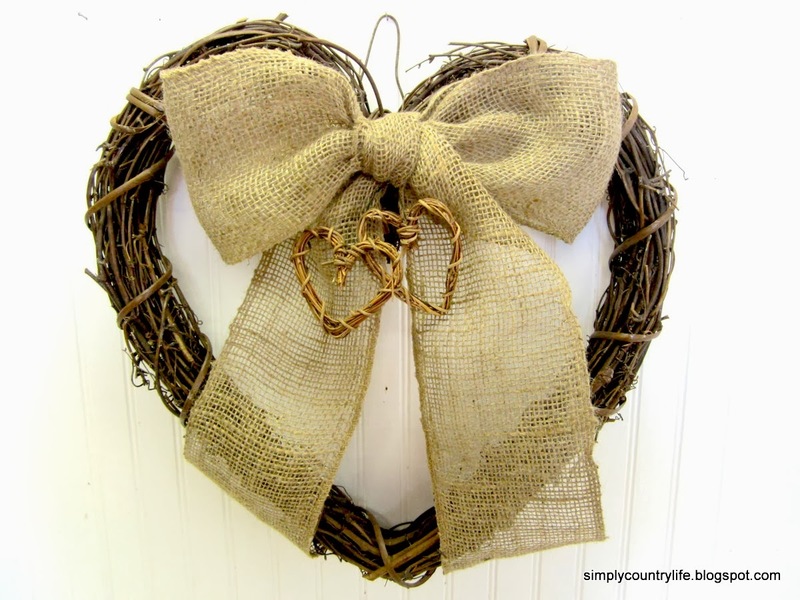 and sewed a piece of burlap ribbon to the inside of each one. and also wired on a burlap bow. 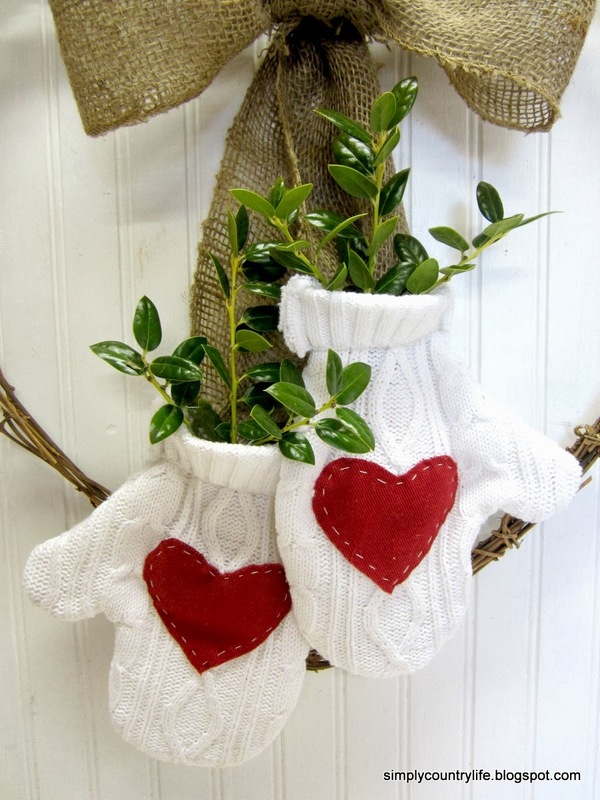 Then I added fresh springs of holly inside of the mittens. At this point, I was happy with the results. and it's full of love for Valentine's Day. This one is going to hang over a mirror inside of our cabin. Here's another rustic Valentines wreath I worked on today for the front door of our cabin. I may add something red to it so it pops a little more. What do you think - add something red or leave it alone? Have you made anything from an old sweater? If so, I'd love to know what you made. I'm ready to make something else, now that I know my machine can handle it. Thank you so much Sherri. The neutral wreath will be hanging on a red front door, so I'm going to leave it for now and see how it looks. I hope you enjoy your week as well. We have a slight chance of snow tonight, I'm hoping we actually get some. I like your heart mittens. Those are sweet! I've never seen a wreath with mittens on it - good designing! And to Sherri Smith... I just can't imagine what it would be like to have never seen snow. When I was a kid, I spent most of the winter with snow down my neck, snow in my boots, snow in my mittens! When I woke up it was 10 below zero on the thermometer. So, no one will be going out to play in the snow today. Thank you Fox and Finch! Flurries have been falling for a little while, but not enough to amount to anything. I'm keeping my fingers crossed for more. Being a native Floridian also, I didn't see snow until I was 22 and took a ski trip to NC. I moved to SC when I got married at 33. Most of my friends back home have never seen snow either Sherri. This wreath is so cute! 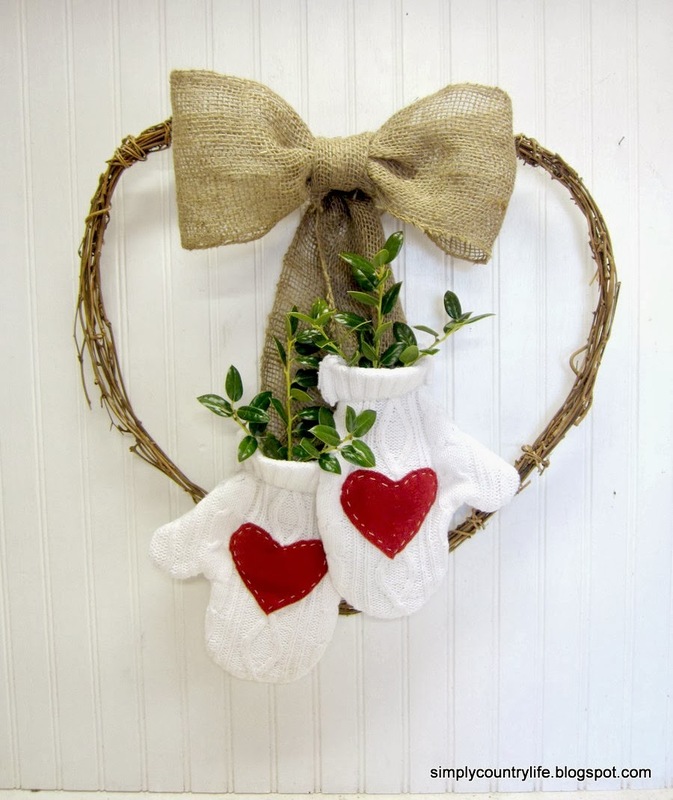 I love the mittens, and I pinned the wreath to my Valentine's Day board. 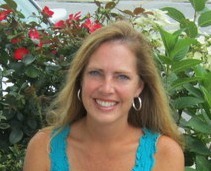 Hi Navey Wifey Peters - I love your spin on being a navy wife, with your blog name and your name. Thank you for your husbands service and your sacrifice as a wife. Thank you for the compliment and for pinning! What a great wreath! I really love the mittens! They're such a sweet touch! Thank you so much Allison. I'm thinking I might make more mittens from a variety of sweaters. I saw a cute idea on Pinterest for an advent calender with different small mittens for each day. Too cute! So creative! I love it!